The ability to convert light into an electrical signal with high efficiencies and controllable dynamics, is a major need in photonics and optoelectronics. In the Terahertz (THz) frequency range, with its exceptional application possibilities in high data rate wireless communications, security, nightvision, biomedical or video-imaging and gas sensing, detection technologies providing efficiency and sensitivity performances that can be “engineered” from scratch, remain elusive. 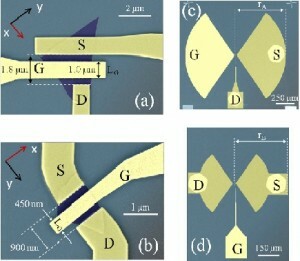 In the publication on Nature-Scientific Report journal, researchers Leonardo Viti, Miriam Vitiello and co-workers, Istituto Nanoscienze and Scuola Normale superiore at NEST Laboratory, by exploiting the inherent electrical and thermal in-plane anisotropy of a flexible thin flake of black-phosphorus (BP), devise plasma-wave, thermoelectric and bolometric nano-detectors with a selective, switchable and controllable operating mechanism. All devices operates at room-temperature and are integrated on-chip with planar nanoantennas, which provide remarkable efficiencies through light-harvesting in the strongly sub-wavelength device channel. The achieved selective detection (∼5–8 V/W responsivity) and sensitivity performances (signal-to-noise ratio of 500), are there exploited to demonstrate the first concrete application of a phosphorus-based active THz device, for pharmaceutical and quality control imaging of macroscopic samples, in real-time and in a realistic setting.